PHILADELPHIA, PA, October 15, 2013 /3BL Media/ – Today, on occasion of the Philadelphia Ronald McDonald House’s 39th birthday, a special ribbon cutting event celebrated the addition of new energy efficient windows at the Philadelphia Ronald McDonald House® at Chestnut Street. The renovations were made possible thanks to the support from the Tri-State Toyota Dealers Association’s advertising through CBS EcoMedia’s EcoAd program. The upgrades -- which will not distract from the original architecture of the 120-year-old mansion -- will replace decades-old windows that are extremely energy inefficient due to rotting wood around their perimeter. But the Tri-State Toyota Dealers Association’s generous support is more than meets the eye. As a result of these upgrades, the Chestnut Street House will see lower heating and air conditioning costs, heating efficiency improvements, and reduced carbon emissions. These savings will allow the Philadelphia Ronald McDonald House to do more good work in their community: providing support services for families of seriously ill children. Today’s ribbon cutting was hosted by: Paul Muller, President, Tri-State Toyota Dealers Association; J.C. Gonzalez-Mendez, CEO and President, RMHC; and Paul Polizzotto, President and Founder, CBS EcoMedia. 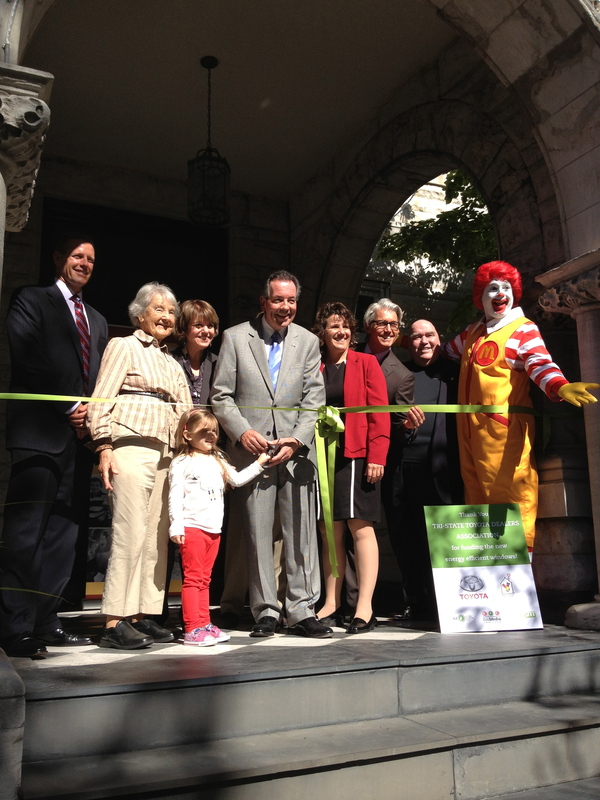 Philadelphia Ronald McDonald House board members in attendance included Anne Scardino, Peter Degnan, and Drew Coyle. Without the Ronald McDonald Houses, many families would be unable to stay close to their sick child while they receive treatment in the Philadelphia area. The Chestnut Street House serves 45 families each night, providing them the opportunity to relate to other families receiving treatment for their children. The Philadelphia Ronald McDonald House proudly serves more than 1,600 families annually with more than 2,300 family stays. The Tri-State Toyota Dealers Association is comprised of 25 Greater Philadelphia area dealers in PA, DE and Southern New Jersey. Since 1974, the Philadelphia Ronald McDonald House has supported families of seriously ill children by creating a community of comfort and hope. Our programs include two Ronald McDonald Houses, two Ronald McDonald Family Rooms at The Children's Hospital of Philadelphia, a Hospitality Kiosk at St. Christopher’s Hospital for Children, and Ronald McDonald Camp. Founded as the first Ronald McDonald House in the world, we are the model for more than 325 Houses around the globe. For more information, please visit www.philarmh.org, follow the Philadelphia Ronald McDonald House on Twitter (@Philarmh), or like the House on Facebook (www.facebook.com/PhilaRMH). At EcoMedia, we're propelled by the desire to create positive social change; that's been our mission since we founded the company in 2002. In 2010, after successfully partnering with CBS on a wide range of environmental projects, EcoMedia became the newest addition to the CBS Corporation portfolio, exponentially scaling our reach across television, radio, interactive, publishing and outdoor media.